This guide describes the basic concepts behind blocks, data types, and vectors, and demonstrates how to create blocks and data types. If you’re new to Lua, don’t worry. Lua is a simple, consistent language that can be picked up easily. Check out Learn Lua in Y Minutes for a quick introduction. The simplest kind of custom block that can be created in LuaRadio is a hierarchical block. A hierarchical block is a composition of several blocks into a single block, which abstracts the underlying flow graph and provides a simpler input/output port interface. Creating a hierarchical block is a matter of instantiating blocks, connecting them, and defining the boundary input and output ports. Hierarchical blocks have no runtime overhead in LuaRadio; they’re simply a convenience. When running a flow graph containing a hierarchical block, LuaRadio runs its internal blocks as if they were directly connected into the top-level flow graph. There are two ways to create a hierarchical block. The first is to use CompositeBlock directly, and the second is to derive a block class from CompositeBlock. In this example, we create a function wbfm_mono_demodulator_factory() which returns a CompositeBlock that can be used as an Wideband FM Mono Demodulator in a flow graph. The argument to the function specifies the time constant of the FM De-emphasis filter (typically 75 μS in the Americas and South Korea, and 50 μS everywhere else). The blocks section instantiates the internal blocks of the demodulator, as well as a CompositeBlock that will hold their composition. The connections section connects the internal blocks. This procedure is identical to building a top-level flow graph, as seen in the Getting Started guide. The type signature section adds a type signature that defines the names and data types of the boundary input/output ports of the hierarchical block. This step creates the external interface to the hierarchical block, so we may connect other blocks to it. The first argument of add_type_signature() is an array of radio.block.Input() descriptors, which specifies the name and data type of each input port. The second argument is the analogous for output ports, with radio.block.Output() descriptors. In this case, there is one input named in of type ComplexFloat32, and one output named out of type Float32. We may call add_type_signature() as many times as we need to register multiple type signatures of different data types as needed, but they must all share the same input/output port count and names. The aliases section aliases the hierarchical block input/output ports we defined in add_type_signature() to concrete input/output ports of its internal blocks. The first one aliases the demodulator’s in port to the frequency discriminator’s in port. The second aliases the demodulator’s out port to the de-emphasis filter’s out port. Note that this invocation of connect() differs from previous invocations, in that the CompositeBlock passes itself in as a block for connection. Instead of building our Wideband FM Mono Demodulator composition in a function, we can build it in a new block class derived from CompositeBlock. The resulting block class will look and feel like any other LuaRadio block. The third line manufactures a new block class with name “WBFMMonoDemodulator” and parent class CompositeBlock. The name string is used for debugging purposes. The remaining lines populate the instantiate() constructor of the manufactured block class. This method is called when the block is instantiated, e.g. WBFMMonoDemodulator(...). The inner workings are basically the same as the function factory above, except that any reference to demodulator is replaced with self, since the class itself is a CompositeBlock. We can use this Wideband FM Mono Demodulator in the same example as before, after replacing wbfm_mono_demodulator_factory(...) with WBFMMonoDemodulator(...). 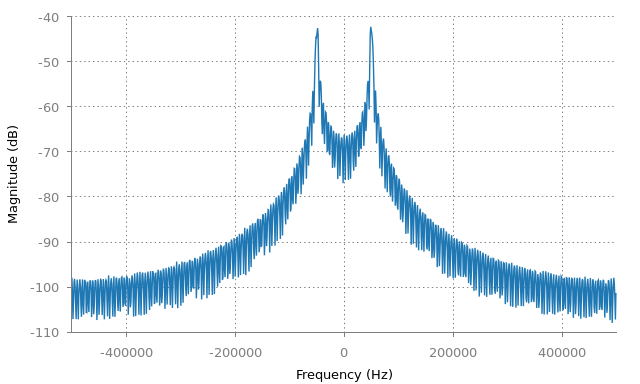 This Wideband FM Mono Demodulator will behave identically, but will have the added benefits of a descriptive block name and being an instance of a well-defined block class. Before we dive in to implementing blocks, we’ll first need to take a look at LuaRadio’s basic types and how to create and manipulate vectors of them. LuaRadio has four basic types: ComplexFloat32, Float32, Bit, Byte. Each instance of these types represents one element, so a radio.types.ComplexFloat32(3, 2) is a complex number with real value of 3 and imaginary value of 2, and radio.types.Float32(123.0) is a real number with a value of 123.0. These types are LuaJIT ctypes, distinct from any of the Lua primitive types. Each basic type is backed by a C structure type. This is primarily for implementation reasons, so that LuaRadio can associate a metatable of operations with it, and so that these instances are distinct from other occurrences of the underlying C type (e.g. float, uint8_t). Despite the structure wrapper, these types are compatible with the C types float complex, float, uint8_t, uint8_t, respectively. See the LuaRadio Reference Manual for all operations defined on the basic types. It would be inefficient for blocks to process one sample at a time, as the overhead of serializing the sample and calling the block to process it would exceed the cost of processing it. Instead, blocks operate on a vector of samples at a time, to amortize the overhead of serialization. A vector is a simple container class for a dynamically-allocated contiguous C array, with only a few auxiliary methods for string representation, resizing, and appending. Each basic type provides two static methods for creating a vector of itself: .vector(num) for a zero-initialized vector, or .vector_from_array(arr) for a vector initialized from a Lua array. Much of block processing consists of either iterating over a vector and modifying its elements, or passing the vector to an external library. Since vec.data is a float * (in the example above) and vec.length is its length, we have all of the information we need to pass the vector memory to an external library for processing. Resizing a vector only causes a re-allocation of the underlying memory when it is grown to a larger size. The underlying memory is retained on resizing to a smaller size; just the bookkeeping is updated. All vectors are allocated with page alignment. This is to enable their processing with certain library routines that require, or perform better with, aligned buffers. This is often because SIMD operations are involved. Note that a Vector’s data is a C pointer with zero-based indexing, where as Lua uses one-based indexing for its arrays. This inconsistency seems terribly confusing, but in practice doesn’t pose much ambiguity: just think C or low-level when working with sample data, and Lua or high-level when working with block arguments and curly bracket arrays. LuaRadio blocks are written in pure Lua, but may interface with external libraries via the LuaJIT foreign function interface (FFI) to offload processing, when needed. Each block is run in an independent process, under its own Lua state. Blocks typically have one hot loop, so they can benefit greatly from LuaJIT’s just-in-time trace compiler, and many pure Lua blocks do achieve good performance without needing acceleration from an external library. In other cases — particularly when the block can be accelerated by SIMD extensions — being able to prototype in pure Lua first, before wrapping an external library, is a nice convenience in block development and can serve as a fallback implementation for non-real-time applications. The instantiate(...) method is the block constructor, called when the block is instantiated. This method should establish basic state and register the block’s type signatures. The initialize() method is called by the framework for additional block initialization before the block is run. In this method, the block’s differentiated type signature and sample rate are available to the block, and can be used to perform additional initialization. The process() method is the main work method of the block. It receives immutable input vectors of samples as arguments, and returns output vectors of samples. This method is called repeatedly by the framework to process inputs into outputs. The cleanup() method is called by the framework when the flow graph has collapsed, right before the block exits. This method can be optionally implemented to perform additional clean up, if necessary. Finally, source blocks and blocks that modify the sample rate must implement the get_rate() method, which returns the block’s sample rate as a number, in samples per second. A type signature defines the names and data types of input and output ports. Type signatures must be added in the instantiate(...) method of a block, so that the block can be connected into a flow graph after it has been instantiated. When a flow graph is run, every block — starting from sources, downstream to sinks — is differentiated into the type signature that is compatible with its input types. The first argument of add_type_signature() is an array of radio.block.Input() descriptors, which specify the name and data type of each input port. The second argument is analogous, with radio.block.Output() descriptors, for output ports. We may call add_type_signature() as many times as needed to register type signatures of different data types, but they must all share the same input/output port count and names. Source and sink type signatures can be described with an empty array for inputs or outputs, respectively. A type signature may also specify custom process() and initialize() methods. When the block is differentiated, its process() and initialize() methods are bound to these methods. If a block with the type signatures above is differentiated to the ComplexFloat32 type, then initialize() will be mapped to initialize_complex(), and process() will be mapped to process_complex(). Analogous mapping occurs in the Float32 type differentiation. This feature removes redundant differentiation from the critical path of process() and makes it easier to separate type-dependent initialization and processing code in a block. A block can look up its differentiated types in initialize() or process() with the get_input_type() and get_output_type() methods. See the LuaRadio Reference Manual for more information. In the example below, we create a multiply block capable of multiplying complex-valued or real-valued inputs. The block constructor instantiate() adds two type signatures with two inputs and one output. The first is for complex-valued inputs, and the second is for real-valued inputs. The initialize() method creates a persistent vector of its differentiated output type (either ComplexFloat32 or Float32) in self.out, which the process() method can use to resize and store output samples in. The process() method resizes its output vector for the input length, performs the multiplication on the two input vectors x and y, storing the results in the output vector, and returns the output vector. Note that this process() implementation is the same for both data types. Inputs are provided to the block’s process() method in the same order that they are defined in the type signature. In this case, the first argument x corresponds to the input in1, and the second argument y corresponds to the input in2. The framework guarantees that blocks with multiple inputs will receive equal length vectors for all inputs, so x.length and y.length are the same in process(). The framework also guarantees that all inputs to a block have equal sample rates. Although we could have created a new output vector in process(), instead of reusing self.out, it would lead to unnecessary memory allocations and deallocations as the vector is created on each call to process() and later garbage collected. If this block were in the path of high sample throughput, then this can also cause more active memory usage than necessary, as the garbage collector plays catch-up. Reusing self.out allows the output vector to approach a steady state size, as it is resized to accommodate the inputs. In turn, this allows the block to reach constant memory usage and spend most of its time on computation and serialization. A block is differentiated with differentiate() by providing an array of its input data types. In this case, an array of two Float32 data types was provided, so that the block would be differentiated into the type signature with two Float32 inputs and one Float32 output. Many of testing jig specifications in the LuaRadio test suite are code generated with Python 3. See the LuaRadio tests/ folder for more details. LuaRadio includes a BenchmarkSink for benchmarking blocks. This sink reports the average throughput of samples delivered to the sink in samples per second. This throughput can be used as a rough performance benchmark of a block. In this flow graph, the multiply block inputs are fed by a ZeroSource, which sources zero-valued samples, and the multiply block output is connected to a BenchmarkSink, which counts received samples over time. The BenchmarkSink periodically reports the average rate of samples consumed. The BenchmarkSink is technically benchmarking the entire flow graph, including the ZeroSource and the framework’s overhead of serializing samples between blocks. However, in this case, the MultiplyBlock is the computational limiting factor by several orders of magnitude, so the overhead of ZeroSource and the framework is relatively insignificant, and the resulting rate corresponds roughly to that of the MultiplyBlock. Other situations may require a different strategy for benchmarking (see caveats below). BenchmarkSink results are specific to the platform, affected by CPU load caused by external processes, and do not take into account the performance degradation that occurs after all available processor cores are utilized in a larger flow graph. Nonetheless, the BenchmarkSink gives a good idea of whether or not a block will be a real-time bottleneck to an upstream block of a particular rate, e.g. an SDR source at 2 MS/s. It’s also important to point out that while the ZeroSource is applicable to many signal processing blocks, which will perform their computation regardless of if the samples are all zero-valued, it might not be the appropriate stimulus for blocks that have value-dependent code paths. In those cases, a random source or a deliberately constructed source may be more appropriate. The MultiplyBlock we created above is pretty fast, but we can interface with a external library to achieve better performance. In this incarnation of MultiplyBlock, we will wrap the VOLK library, a library of signal processing routines with SIMD acceleration. VOLK provides kernels for multiplying both complex-valued vectors and real-valued vectors, with volk_32fc_x2_multiply_32fc() and volk_32f_x2_multiply_32f(), respectively. The LuaJIT foreign function interface (FFI) allows LuaJIT scripts to call C functions and access C symbols in dynamically loaded external libraries. This requires defining the function prototypes and relevant constants first, like a C header file would, so that LuaJIT has the necessary information to translate types and operate the C ABI. The example defines the functions for the two VOLK kernels in ffi.cdef(). The first is for multiplying complex floats, and the second is for multiplying real floats. The definitions are function pointers, because VOLK kernels are exposed as function pointers (despite their prototypes in the VOLK documentation). These definitions are almost identical to their library prototypes — volk_32fc_x2_multiply_32fc() and volk_32f_x2_multiply_32f() — with the exception of substituting the VOLK lv_32fc_t type for complex_float32_t, and the C float type for float32_t. The substituted types are binary compatible. The substitution is necessary for the FFI to accept the use of the LuaRadio ComplexFloat32 and Float32 data types in those argument positions and not raise a type mismatch. Other alternatives are to use a typedef alias or ffi.cast(). Next, the example looks up the VOLK library from the radio.platform.libs table. This pre-loaded table has a few computational libraries (VOLK, liquid-dsp, FFTW) that are used by several blocks in the LuaRadio codebase for acceleration. To load a different library, the ffi.load() call can be used directly. Rather than sharing one process() method, as the previous MultiplyBlock implementation did, this version of MultiplyBlock binds a custom process method with add_type_signature() to each type signature, since the library call depends on the differentiated type signature. Each process() method resizes the output vector, calls the library routine with the input vector data and output vector data, and returns the output vector. This performance improvement is not substantial, given that the block is already in the relatively high rate territory, but in other cases — particularly filtering and DFT — the performance improvement from wrapping an optimized external library can be an order of magnitude or more. Those cases are worth accelerating for real-time applications. In this FFI example, we create a binary FSK (BFSK/2FSK) modulator block by wrapping the FSK modulator in the digital signal processing library liquid-dsp. This example demonstrates adding new functionality to LuaRadio by wrapping an external library with the LuaJIT FFI. fskmod_create(m, k, bandwidth) creates and returns a fskmod object with bits per symbol m, samples per symbol k, and total normalized signal bandwidth bandwidth. fskmod_destroy(q) destroys an fskmod object, freeing all internally-allocated memory. fskmod_modulate(q, s, y) modulates the input symbol s, storing k samples per symbol number of output samples to y. The fskmod module is a M-ary FSK modulator, but since we’re only implementing binary FSK for our block, we use 1 for the bits per symbol parameter m. The other parameters (samples per symbol m and normalized signal bandwidth k) are functions of the block’s input bit rate, output sample rate, and specified FSK deviation. The ffi.cdef() call defines the liquid C API for the fskmod module. This consists of an opaque structure pointer aliased to fskmod, create and destroy functions for the fskmod object, and the main fskmod_modulate() method, which takes an input symbol (in our case, a bit) and writes the samples of the modulated signal to a complex-valued array. These definitions are identical to those in the liquid.h header file, except for substituting the float complex type for the compatible LuaRadio data type, complex_float32_t, in fskmod_modulate(). The block’s initialize() method computes the relevant parameters for fskmod_create(): the number of samples per bit and the normalized frequency deviation. The samples per bit parameter is computed by dividing the output sample rate — specified in the constructor — by the input bit rate. The input bit rate is looked up by using the Block superclass’s get_rate() implementation, which returns the rate of the upstream block, since this block redefines get_rate() for the samples it produces. It creates the fskmod object with these parameters, and a ComplexFloat32 persistent output vector in self.out. The fskmod object is wrapped with ffi.gc(), which attaches the fskmod_destroy() finalizer to the object. In effect, fskmod_destroy() will be called on the fskmod object when it is garbage collected. This allows us to delegate the resource management of the fskmod to LuaJIT’s reference counting and garbage collection, so we don’t have to worry about managing it. The BFSKModulator implements a custom get_rate() because its output samples, the complex-valued BFSK signal, do not share the sample rate of its input samples, the bit stream. The process() method resizes its output vector length to the input bit length times the number of samples per bit. It calls fskmod_modulate() for each bit value with the proper offset into the output vector, to modulate each bit into samples in the output vector, and it returns the output vector. The liquid fskmod module actually supports modulating M-ary FSK, by choice of M in fskmod_create(). This example can be extended to a generic M-ary FSK modulator by propagating this parameter to fskmod_create() in initialize(), and by batching input bits into a base-M number that is passed to the input symbol argument of fskmod_modulate() in process(). LuaRadio’s four basic types serve well for most signal processing needs, but are insufficient for higher-level blocks that need to produce or consume more complex aggregate types. This need arises quickly in digital systems, where a bit stream may be framed into a data frame, a data frame decoded into a packet, and so on. LuaRadio offers two solutions for custom types. The first, called a CStruct type, is a type backed by a constant-size C structure. This is appropriate for fixed size data types and is efficiently serialized between blocks. All four basic types are themselves, in fact, CStruct types. The second, called an Object type, is a type backed by any Lua object. Instances of this type can be variable size and contain any Lua primitive data types (tables, numbers, strings, booleans, etc.). Object types are not as efficient as CStruct types, as they are marshalled and unmarshalled with MessagePack when serialized between blocks. However, for relatively low rate uses, they can be very effective. CStruct types are manufactured with the radio.types.CStructType.factory(ctype, methods) factory function. The first parameter is the name of the C structure type, and the second parameter is an optional table of methods and metamethods to be associated with the type. The type will automatically inherit .vector() and .vector_from_array() static methods, so that vectors of the type can be created by blocks, as well as internal serialization methods, so that the framework can serialize the type between blocks. See the LuaRadio Reference Manual for more inherited methods of CStruct types. In this example, we construct a fictional type FooFrame with a 16-bit address field, 8-bit type field, and 4-byte data field. We associate a __tostring() string representation method on the type it, as well as isbeacon() and isdata() methods to test the fictional frame type. Object types are manufactured with the radio.types.ObjectType.factory() factory function. The type will automatically inherit .vector() and .vector_from_array() static methods, so that vectors of the type can be created by blocks, as well as internal serialization methods, so that the framework can serialize the type between blocks. In addition, the type will inherit the .to_json() method to form a JSON representation, enabling the type to be used with the JSONSink. See the LuaRadio Reference Manual for more inherited methods of Object types. After an Object data type is created, its .new() constructor must be implemented. Additional methods can be defined directly on the data type class. In this example, we construct a fictional type BarPacket with string address and data fields. We define its constructor and a __tostring() method. As the example shows, BarPacket can contain variably sized fields. Vectors of Object types provide a similar interface to CStruct type vectors. Note that their data array is also zero-indexed, for consistency with CStruct type vectors. Digital blocks that manipulate Bit typed vectors often need to convert bits into numbers and perform bitwise operations on them. The Bit data type provides the static method .tonumber() that operates on Bit vectors to extract numbers from bits. This method takes a Bit vector as its first argument, and optional arguments offset, length, and bit order to specify most kinds of bit extractions. The discrepancy here is that the Lua number type is a double, and the bit operation results are returned as signed 32-bit numbers in a double. 0x80000000 and -2147483648, 0xffffffff and -1, 0xfffffffe and -2 are all two different double numbers. These caveats will disappear and bitwise operations will be a lot more natural if a future version of LuaJIT implements the Lua 5.3 language, which has a 64-bit integer type and native bitwise operations. For prototyping with Lua, the LuaJIT REPL is a bit too minimalist to be productive. As in the original Lua 5.1 REPL, it requires preceding expressions with “=” to print their value, and it doesn’t support dumping tables. I suggest using Torch’s trepl for prototyping, available in LuaRocks. It supports table dumping, pretty printing, tab completion, and line history. For some blocks, it may be more productive to prototype signal processing routines in Python, with libraries like numpy, scipy, and matplotlib, which allow for more traditional sample by sample development and plotting than a flow graph paradigm like LuaRadio. When the routine is ready, it can be ported to a LuaRadio block for performance and reusability. Samples from LuaRadio can be dumped to a file with the RawFileSink, IQFileSink, or RealFileSink, and imported into Python for inspection with the numpy.fromfile() function. The numpy.float32 type is compatible with LuaRadio’s Float32 type, and the numpy.complex64 type is compatible with LuaRadio’s ComplexFloat32 type. The reverse is also possible with numpy ndarray’s .tofile() method, and the RawFileSource, IQFileSource, or RealFileSource blocks.